One of the most disruptive minds in the welding industry, Ryan Blythe created Georgia Trade School to serve an otherwise college bound population. In just six years his vision has led to a rapid rise in both business and media. Ryan has appeared in dozens of media forms including multiple appearances in the Wall Street Journal and the homepage of Yahoo! Other media appearances have included WAGA and WXIA television, School for Startups Radio, The Marietta Daily Journal, Cobb Business Journal, Cobb In Focus, The Georgia Contractor, Maritime Professional, The Fabricator and Welding Journal. Lending his expertise to the community, Blythe served on Georgia Governor Nathan Deal’s Go Build Georgia Advisory Council and the Boards of the Kennesaw Business Association and the Construction Education Foundation of Georgia (CEFGA). 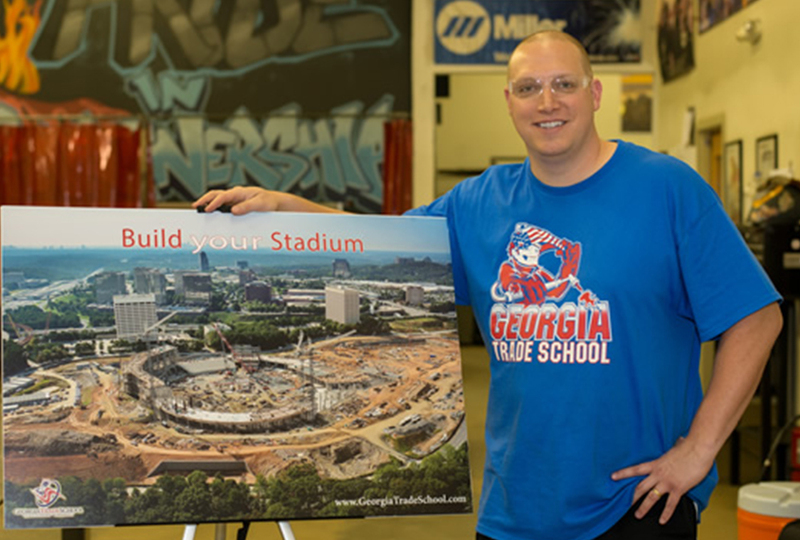 In 2013, Mr. Blythe was nominated for the Kennesaw Business Association Person of the Year award and is a three-time finalist for that organization’s Business of the Year Award. In January 2014, Mr. Blythe was interviewed for the cover story in the Fabricator Magazine entitled “Where the best welders go, and why” highlighting Georgia Trade School’s position as one of the top welding programs in the nation. The recognition continued in May 2014 and 2015 as the Metro Atlanta Chamber of Commerce named Ryan a Semi-Finalist for their Small Business Person of the Year award. Georgia Trade School also represented the city of Kennesaw in the 2013 Georgia Economic Development Association “Rock Stars” Award. In June 2016, the Cobb Chamber of Commerce awarded Georgia Trade School the prestigious Top 25 Small Business of the Year. It would be the first of three consecutive wins in that category from one of the top Chambers in the United States. In 2018, Blythe became a contributor to Around Acworth Magazine and the Marietta Daily Journal. In both publications Ryan writes about the intersection of manufacturing, construction, business and politics. A Mobile, Alabama native and a resident of Smyrna, Blythe attended Providence Christian Academy and Oglethorpe University, which adjusted for student body size trails only Stanford and MIT in producing entrepreneurs. Ryan’s current memberships include the Cobb Chamber Chairman’s Club, the Gulf States Shipbuilders Consortium, the American Welding Society and the Fabricator and Manufacturers Association. Advice to aspiring welders? Listen to everything Miss Elaine says!